At times, a player’s emotions tend to go over the boil during a football match. It may have been due to an unfair call by the referee, a dangerous tackle by an opponent, misplaced passes during a counter-attack or maybe simply being too selfish and going for all the glory when there are other teammates in better positions. These instances may be few and far between, but there have been plenty of occasions when the ignominious side of football has reared its ugly head and some brutal fights have broken out on the field. 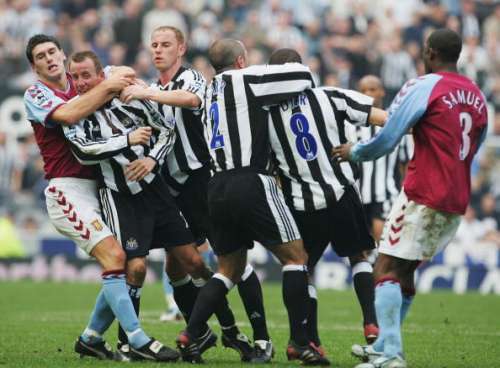 Let us take a look at 10 of the biggest altercations that took place during a football match. As if being 3-0 down to Aston Villa at home wasn’t bad enough already, Newcastle fans had to then witness 2 of their own players fighting it out on the half-way line. In 2005, Lee Bowyer and Kieron Dyer, both England internationals, fought it out in front of the St James’ faithful. Both players were furious with each other and when Dyer refused to pass Bowyer the ball, all hell broke loose, resulting in shirt-pulling, scratching, and shouting before peacemaker, Aston Villa’s Gareth Barry eventually broke them up. Needless to say both players saw red-cards in what can only be described as one of the Premier league’s more embarrassing fights.